Goals from Jimmy Keohane and John Goddard ended Forest Green Rovers 100% unbeaten run in an enthralling contest at the Laithwaite Community Stadium. Hill made two changes from the weekend which saw Woking score 4 goals, but more worryingly for Woking was the four goals that they conceded, which essentially meant the cards dropped two points. Godfrey Poku and the injured Joey Jones made way for loanee Harry Cardwell and Kieran Murtagh, as the midfielder returned as captain on the night. The game began with a highly intense approach with both sides coming close to scoring in the early stages of the tie – Dan Holman kept goalkeeper Jonny Maxted on his toes with a fine 20 yard strike. From a quick counter attack Rover’s Kurtis Guthrie nearly curled an audacious effort just past the post. Within minutes, Woking were at the other end with a corner and it was Brian Saah who met the cross, connecting perfectly, only to have his header cleared off the line by Sam Wedgbury. Early in the game it became evident that if there was an injury cruse, Woking were certain being hit by it! Chris Arthur was the next victim to join the injury list as he left the field with a pulled hamstring. Therefore, Kadell Daniel made his way onto the pitch for Arthur at left back. Just before half time Forest Green had a disallowed goal as Aaron O’Connor nodded in a high lofted ball. Moments later the hosts went ahead through John Goddard as he broke through the Rovers defence and had a shot saved, with the ball flicking back up to Goddard, he then headed back past Maxted into the Forest Green net claiming his 7th goal of the season. 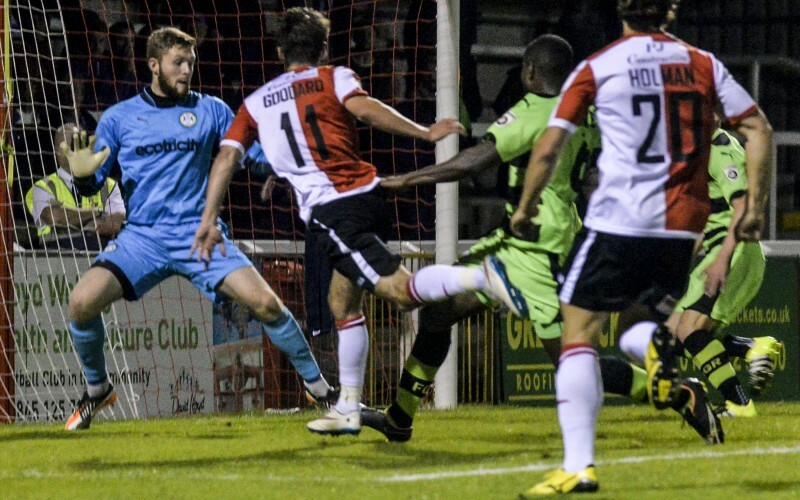 Woking found themselves in a position to beat the “unbeatable” Forest Green Rovers going into the half-time break. Rover’s manager Ady Pennock certainly rung a few bells in the Forest Green dressing room, as the away side slightly improved in the second half. However, against the run of play with Forest Green putting a lot of pressure on the Woking defence, Jimmy Keohane put the home side two-nil ahead with a fine sliding shot at the back post. Forest Green got themselves back into the game, when Kurtis Guthrie hit a well driven shot into Jake Cole who misjudged the ball, letting the ball slip between his legs, giving Forest Green the goal they desperately needed. A late surge came and went from Forest Green and so did defender Marcus Kelly, after entering the game as a substitute he left the field of play with minutes to go on the clock, as he was sent off for a second yellow card offence. Woking then held on to their 100% home record and a truly deserved victory on the night. Forest Green Rovers losing streak at Woking continues, but what matters most to non-league fans around the world is the top of the table gap is now down to five points. 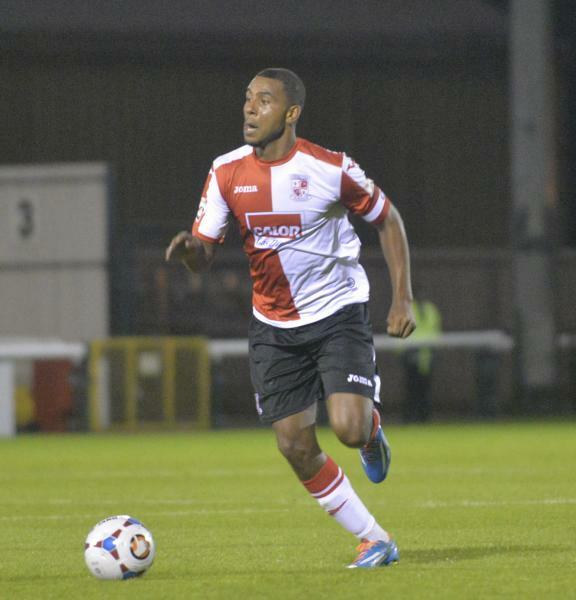 Woking now look ahead to their next fixture against former League 2 side, Cheltenham Town. You can catch all the match build up, during and after the match with us on Radio Woking this Saturday! Join us from 2pm. With the Saturday Sports show. Woking: J. Cole; J. Caprice, B. Saah, T. Thomas, C. Arthur (K. Daniel 29); J. Goddard, K. Murtagh, J. Keohane, B. Andrade (G. Poku 88); D. Holman, H. Cardwell (G. Sole 66); Subs not used: B. Pattie, N. Hamman. Forest Green: J. Maxted; D. Pipe, D. Bennett, A. Racine, J. Jennings (M. Kelly 20); K. Marsh-Brown, R. Sinclair, S. Wedgbury, E. Frear (D. Sam-Yorke 75); K. Guthrie, A. O’Connor; Subs not used: C. Clough, D. Jones.